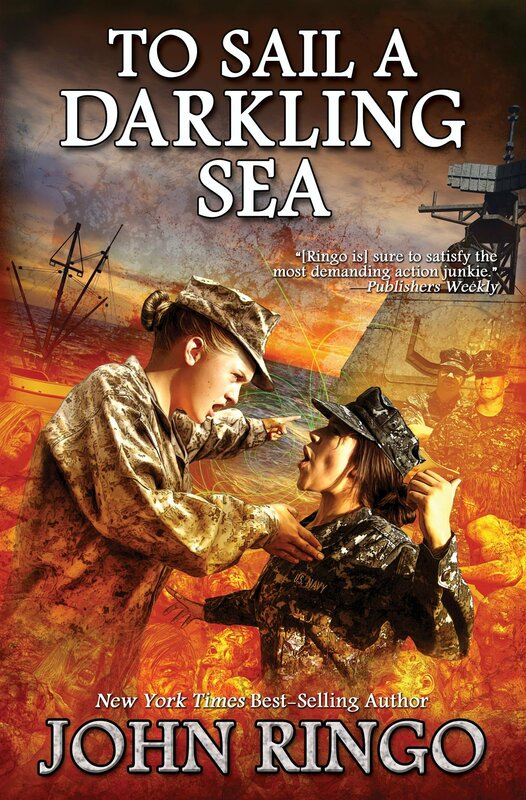 Welcome back our irregular reviewer Chris Smith as he tackles “To Sail A Darkling Sea” by John Ringo. Well, here we are. Yeah, it’s really late, since the book was released months and months ago (Februrary-ish) but I finally cleared my extremely busy schedule to write the review. Work, work, work, that’s me. Ok, I forgot that I told Jason I’d do it. ‘Sail’ takes up a totally different aspect of the whole zombie genre, with our characters spending a lot of time on introspection and really getting to know the infected. What is this person’s motivation? How can we look at the human condition in the same way after the majority of humanity has been reduced to their base wants and desires? Are you really a good person if you don’t take the time to get to know the infected person in front of you before you slam a kukri into their eyeball? Can’t we just use the power of love and inclusiveness to conquer all? Ok, that was tough to get through with a straight face. C’mon folks, it’s Ringo. The only good zombie is a dead zombie. ‘Sail’ picks up very close to the end of ‘Sky,’ with some overlap. The opening scene shows the beginning of the breakout aboard the Iwo Jima, and progresses from there to the Smith’s clearing the ship. As the story progresses, we get to see the, now larger, Wolf Squadron in action, as well as the flotilla coming together as a unit. This is important, since it’s a four book series. Here, though, we get to see more character development, as well as the addition of several key supporting roles. Where ‘Sky’ set the stage as to the personalities of the main characters, here they get to grow. Basically, what we see is two young girls becoming members of an active military unit, and Steve dealing with the weight of command. Faith has to learn how to be a junior Marine officer, and the conduct that requires, Sophia deals with the pressures of being a ship’s skipper, and the emotional and physical burdens that brings. Steve juggles the double load of sending his daughters into harm’s way, knowing they are capable of handling it, but also dealing with the consequences of their ‘personality quirks’ for lack of a better term, in a professional military manner. Here’s one of the things that endears the series so far to me. I’m a former Air Force Brat, with no time in service. That puts me in the position of straddling the line between Active Duty and Civilian. There’s some things that I ‘get’ about the military lifestyle and being AD, but there’s a lot I don’t, simply because I never had to quite follow the same rules as the AD. However, the Black Tide series allows us to see that career and what it entails through the eyes of Faith and Sophia, two (sorta) Brats thrown into a full Active Duty situation. They were civvies, now they are Service. Their mistakes and mindset- and more importantly, how they evolve- give us non-service folks an insight into what it means to sign on that line. Perfect case in point- Faith handles a harassment situation instinctively, and is subsequently corrected by a superior officer, [Marine Capt.] then THE superior officer, Steve. Steve is required to handle the situation as both a commander and father of a teenage girl. Seeing him wear both hats, and still react accordingly is eye-opening for a civilian. (Granted, this is an idealized version of what happens, however, it is a great example of how it SHOULD be done.) Later on, Steve confronts Faith’s superior. How he is written, as both a Commander and father, is handled adeptly. ‘To Sail’ is less world building, but more character and squadron development heavy. This is not a bad thing. There are plenty of great, funny, and hair-raising action sequences, but the infected are not the core focus of the book. This is not a bad thing. Like UAGS, the survivors are just that-survivors. No hand wringing for hours about a course of action that doesn’t offend the masses, just the desire and know-how to make decisions quickly, effectively, and lethally. We are allowed to see how this group begins to come together as an effective unit, and honestly, this is where we see the groundwork for its success in the future. There is hope for the future, simply because the right people are trying to bring it around. All in all, it sets the pace for the next book, bringing Wolf Squadron together as a functional unit, one that can keep the flame burning in the worst darkness human kind has ever experienced. An excellent addition to the series, a fast read, and fun.